Great review Rita. This was the first of Joana’s books that I bought and I absolutely loved it. So much so that I bought all her others. I was a little wary of The Unthinkable Triangle cos I don’t like to think of Elizabeth with anyone else but I read the reviews and decided to give it a go and I’m so happy I did as it was well up to her usual standard. The Falmouth Connection almost had me crying for poor Darcy. Great book and obviously please don’t enter me in the giveaway. Thanks so much, Glynis for the wonderful words and all your support! So glad you liked TUT, I remember you saying you approached with caution 😉 but it’s great to hear I haven’t put you off. I’m mean to Darcy in TFC too, but nothing like TUT, poor man. That’s OK, I’m moving on, it’s open season on being mean to Elizabeth in my next 2, hope you agree. Huge thanks for stopping by to read and comment, it means an awful lot. All the best! Thanks, Rita, for the amazing review, I’m absolutely speechless! I’m over the moon that you liked TFC and your wonderful review just made my day! Can’t wait for us to meet face to face, it’s going to be fantastic!! What can I say about this book that Rita hasn’t already mentioned?! 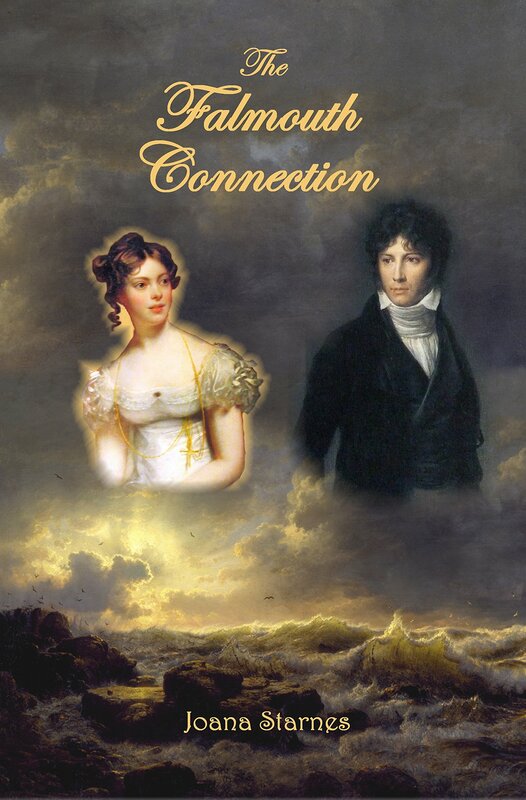 I have read The Falmouth Connection,savoured each and every word, absolutely adored it and naturally gave it 5*. Starnes is a marvellous storyteller. Her sheer ability to write beautifully crafted storylines and real life characters mean that we,as readers,have a unique opportunity to witness a love story unfold before our very eyes. We are privy to their inner thoughts and to have this vantage point allows us to see their romance blossom, to understand how and when they started to fall in love and then see their relationship develop. The reader is closeted,taken under Starnes’ wing and enveloped in such a sense of security that ensures us that no matter the trials and tribulations faced by ODC,their HEA (and ours!! ), is assured! I echo everything you’ve written about this book Rita and can only recommend that all Austen fans treat themselves to a Starnes. I must ask if you’ve read the equally compelling The Unthinkable Triangle,penned by the same author??? Now that book is…..but that’s a story for another day. Thank you Rita for such an enthusiastic review! Thanks ever so much for the wonderful words, Mary, I’m overwhelmed! So happy that you like my writing style, with me dwelling on every thought that makes them fall in love. Many thanks again for your kind words and support, MUCH appreciated! Wow! Mary I could not imagine a better description of Joana Starnes stories and writing style than the one you just wrote! You’ve said it all in the most truthful and insightful way! It was a true pleasure reading your comment! Yes, I also read TUT and loved it!! The depth of Darcy’s feelings in that book were almost overwhelming, it still amazes me how Joana Starnes is able to transmit so much emotion with her words. Thank you so much for your comment, I loved reading it so much! You should write reviews as well, you are so good at describing why you love a book! So, again, thank you! That is so cool that you get to meet up with Joana. She has such a warm and friendly presence on line when I see her FB posts. I know you gals will have fun. Thanks, Sophia Rose, I hope you’ll like them. I’m so bad, either I devour 1 JAFF / day or I get my head under the virtual bonnet and don’t come out for months. You’re so kind about my online presence, hit and miss as I am 🙂 I’m really looking forward to meeting Rita face to face, it’s going to be wonderful. So amazing how we make friends across hundreds of miles in our JAFF world and it feels like we’ve known them forever. All the best and thanks for the kind words! I have also loved and admired all of Joana’s books. Not only does she have a beautiful writing style that flows in such a natural manner, her in-depth knowledge of the English countryside, as well as its cities, sets her variations apart when one examines the details and the settings she incorporates in her work. Lovely review of an unforgettable story. I hope you have a memorable visit together! Huge thanks, Claudine, for the wonderful comment and all your support! I admit I’m tempted to include little things I come across in my trips and I’m so glad that you feel they enhance the story. With TFC it was more than that, the whole story was inspired by beautiful Cornwall, by the romantic gardens at Cotehele and all those beaches that must have seen plenty of smugglers in their time. I’m so glad you liked it, and I hope one day I might have a chance to meet up face to face with you as well. Best of luck in the giveaway, Mary Beth and thanks for stopping by. I hope you’ll like the story! Great review. I love this book. The ‘good heavens’ moment is so brilliant. So funny, and the first kiss is wonderful. So kind of you to stop by! Can’t wait for more books from you, I LOVE your style! Lydia is definitely her mother’s daughter!! Thanks, Joana. I’ve a new book coming soon. This review makes me want to read TFC all over again. Yay! Wonderful news, Caitlin! A new book by you is such a treat! Hurry – hurry – hurry!! I really enjoyed this book as well. I like who Colonel Fitzwilliam ends up with! I thought that was hilarious! My first book of Joana’s was ‘From This Day Forward’ and from there I was hooked. Thank you for the giveaway as I would love to win a signed copy of a ‘real’ book! Enjoy your visit! Yes, I went on a weird track there, didn’t I, with the dear Colonel’s love life 😉 . What he suffers at my hands!! I’m so happy to hear you liked my books since FTDF, it’s wonderful to hear that. Thanks for your support, much appreciated, and best of luck in winning this one! I read this book twice – but it was a loan from Joy…so I would love to own my own copy. Love all her books. Great review. Thanks for all your kind words, Sheila, here and everywhere else. So happy to hear you loved my books, it means so much! Best of luck and thanks for stopping by to read Rita’s marvellous review. Wonderful review and high praise for Joana! It really was an amazing review, Denise, it made my day! Thanks and best of good luck! I love this book too! Even now, I only have to think about the ‘garden scene’ and I start melting into a puddle all over again. I have an ebook copy but to win a signed paperback would be amazing. I hope you enjoy your get together with Joana. Looking forward to meet face to face with you too someday soon, fingers crossed. Hope we can do that. Hugs and all the best! Wonderful review! I went and read some of the other reviews as well and picked out the words us: excellent, lots of fun, 5 stars, loved it, emotions, play, masterly,.. You can not not want to read it. So thank you for this wonderful chance to at least have a chance to do so ❤ I've always enjoyed a good historical romance. And regency, yay! I have read and enjoyed The Unthinkable Triangle, but have not had the chance to read this one yet. I would love the chance to do so! Sounds like a gripping story! Thanks so much for your kind words, much appreciated! I’m over the moon that you like my books and I hope you’ll like this one too. Best of luck in the giveaway and thanks for reading & commenting on Rita’s ever so kind review. Lovely review! This books sounds like a wonderful read. Am excited to get my hands on it!! Thanks for the giveaway opportunity! Great review, I’m looking forward to read this book now. Fingers crossed for the win and I hope you like it! Hello! Entering the giveaway, fingers crossed! As you know, I’m new to fanfic reading, but your glowing review has certainly piqued my curiosity – meeting in a cove sounds promising! I rely on your guidance, Rita, to point me to the best fanfic out there, and I hope to get to read some published fanfic soon! Wonderful review. This is on my ever growing TBR list but just got bumped up top. Thank you for the giveaway. Wonderful to hear that, Becky 🙂 Hope you’ll like it. Those TBR lists, they keep growing and growing, every time I read 1 I add 15 (thank goodness for all the JAFF out there!!) Best of luck and thanks for stopping by to read Rita’s great review! With a review like that, how could anybody not place this title on their top-five list of “Must Read” books? Well I certainly have. Winning a copy would be nice too! Many thanks for offering a giveaway. Looking forward to notes on your meeting with the author. Thanks for the kind words and for stopping by to enter the giveaway! Best of luck and I hope you’ll like it. Such a wonderful review Rita. It really was, Marta! Huge thanks again Rita! So glad you stopped to read Rita’s review, Marta, and fingers crossed for the win! I’ve had this book on my wish list for a while just haven’t got round to it yet. I read a review of it on Austenesquereviews and thought it sounded really really good. I also love books set in Cornwall. I’d love to win it so fingers crossed. Wonderful to hear that, Teresa. Fingers crossed and I hope you’ll like it. Sounds like a wonderful read! Count me in. Thanks for reading the post and taking part in the giveaway! Best of luck and I hope you’ll like it! Sounds like a beautiful story. I’ve read a few of Joana’s books, but not this one. The latest I’ve read is The Unthinkable Triangle and I really loved that one. Very sad in some parts, but wonderful! He’s getting a better treatment in The Falmouth Connection and there’s a spot of cloak-and-dagger too, so I hope you’ll enjoy that variation as well. Best of luck in the giveaway and thanks for taking part! I’ve also loved TUT arjanne, but I confess that The Subsequent proposal occupies a special place in my heart 🙂 Have you read that one? I have yet to read a book by this author. But I own The Subsequent Proposal which I am looking forward to reading! Thanks for the chance to win a copy of this book! It sounds very engaging. Thanks for stopping by to read Rita’s wonderful review, Maria. I hope you’ll enjoy The Falmouth Connection if you win it, and The Subsequent Proposal too. Thanks for the kind words and best of luck in the givewaway! You got me hooked. Plus I want to if I will like this Mrs. Bennet. Time to go add this to my want to read/to read list. Thanks for the lovely comment, Amanda, I think you might like this Mrs Bennet and with any luck, my other Mrs Bennets too. Maybe I’m too soft on her in my portrayals, but I can’t quite see her as a harsh and deliberately unkind or cruel mother. Pretty dense and extremely embarrassing, yes. Rather selfish – that too. But also practical and in touch with reality, much more so than her charming but irresponsible husband. What fate other than marriage can genteel young ladies aspire to, and the higher up the social scale, the better? I really feel sorry for her, to have the threat of the entail hanging over her head and not realise that she’s one of the greatest obstacles in her daughters making a good marriage. Which is probably one of the reasons i was even kinder to her than usual in The Falmouth Connection and I hope you’ll like that. Best of luck in the giveaway and thanks for taking part! Personally, I loved ‘The Falmouth Connection.’ I don’t have to have canon when I buy a P&P variation. What I look for is a well written story with a good plot whether vagary, canon or whatever. This book was a delight to read because it was so different from any of the others I’d read, and that was refreshingly different. Oh I agree with everything you said about the Falmouth Connection as well as Joana’s unique gifts as an author. Her specialty seems to be not only expressing, but invoking deep, intense, after overwhelming emotion in the reader! So amazing! Do not enter me in the giveaway, I own all her books already! Congrats Joana on such beautiful book! I eagerly await your next one . . . and the on after that . . and the one after that! I couldn’t have said it better Jeanna! As soon as I finish Hope for Mr. Darcy, I’ll be reading Joana’s latest release, Miss Darcy’s Companion, for sure! I love this book, I’ve got it on my kindle. It was recommended by a friend and I’m so glad I bought it. It’s well written with an excellent story line and the all important HEA. I was pretty sure I wanted to read this before your review and now after reading it I am positive! This looks great and it would be interesting to see the proposal from a different perspective 🙂 Thank you for your wonderful review! Your review is spot on! Joana Starnes is one of my 3 favorite JAFF writers, and Falmouth connection is my favorite of hers. I love the chemistry that always builds between Darcy and Lizzy, and her unique settings. I am anticipating her next book to be just as wonderful and can’t wait for it! I love your review so much I can’t wait to read the book. I love the sizzle between Darcy and Lizzie and since this focuses on that I’m even more excited to read it. If I don’t win I’ll happily purchase one myself. Have fun meeting. Joanna Starnes is another author of delightful P&P variation books. I consider each one to be a must-own and a re-read story. Thank you, Joanna, for all the pleasure you have given me. I loved this book, I have the ebook but would love a paperback too! Joanna Starnes is an amazing writer infusing angst filled moments with swoon worthy ones that just tugs at your heartstrings. You can’t but fall in love with her Darcy and Elizabeth. How exciting that you’ll be meeting each other! Hope you have a wonderful visit. I loved this book. The scenes between Elizabeth and Darcy were beautifully written. I found myself lost in the settings that were created. I would love to have the paperback. There is nothing better than holding a good book. how awesome! I have never read it but I sooooo want to! I love the idea of someone saving Mr Darcy from himself by stopping his proposal at Rosings. Glad that it’s Col Fitzwilliam to help him in this instance. Can’t wait to read this one again. It was great.